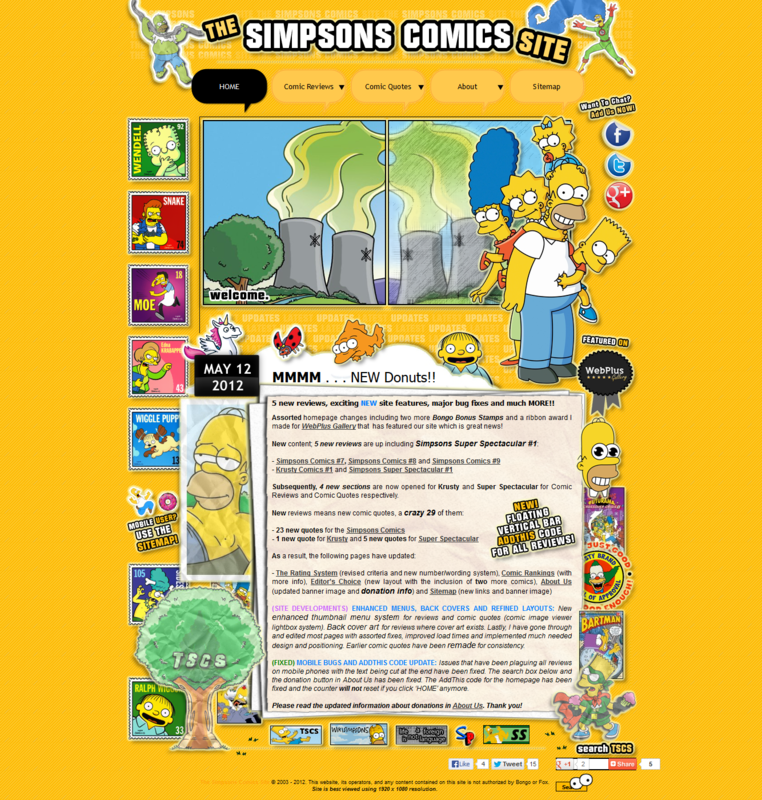 The Simpsons Comics Site reviews the Simpsons Comics series. It's written and founded by Michael Daaboul who is known as MikeStar on The No Homers Club forum. News and updates for The Simpsons Comics Site (TSCS) can be found via his blog on Tumblr called Life As A Writer which showcases his creative writing. A full list of updates for TSCS can be found using this link. The Simpsons Comics Site is the only comprehensive review hub for the Simpsons Comics on the net that rate the comics out of 100%. The site also includes hilarious full image comic quotes directly from the comics. These are enhanced for high resolution devices. A rating system is used to review the Simpsons Comics series based on certain criteria that the comics are marked on. These include factors such as presentation, graphics, story and lasting appeal with an ending score. The site also gives out awards for high scoring comics and even has a ranking's and an editor's choice awards page. The end goal for the site is to have a complete archive of Simpsons Comics reviews (with constant updates) and comic quotes for visitors to enjoy and to think about adding a comic they might not have in their collection that has scored highly. Michael plans to update the site to be responsive to today's standards but other commitments have since delayed the progress of the site. He hopes to come back to this project as he still collects all the comics today. We hope he does. Modified on November 15, 2016, at 19:19.